Want a hands on experience that combines fire, metal, and craftsmanship? 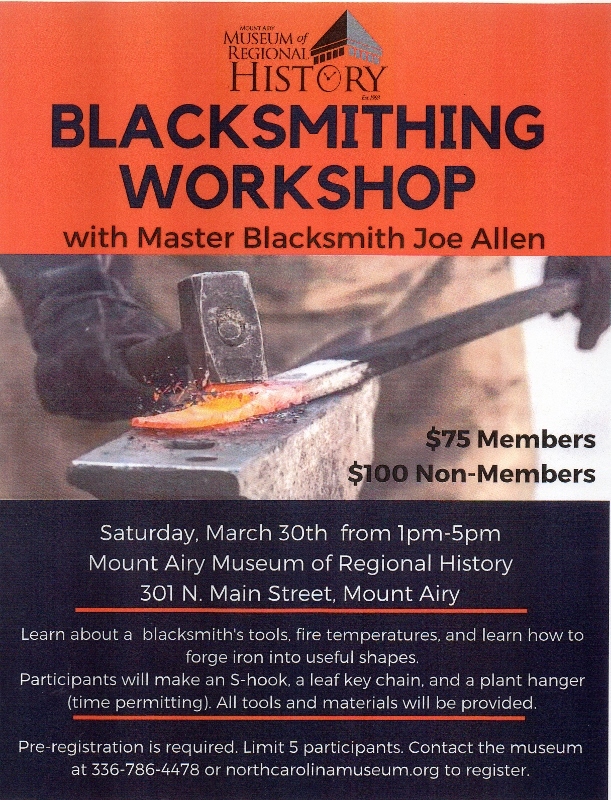 Join Master Blacksmith Joe Allen for an educational afternoon learning about the tools, knowledge, and skills required to forge iron. Participants will make an S-hook, a leaf key chain, and a plant hanger (time permitting.) All tools and materials will be provided. This class is limited to 5 participants to ensure all projects are completed. $75 for Museum members; $100 for non-members For more info or to make a reservation, contact Justyn at 336-786-4478 ext 228 or jnkissam@northcarolinamuseum.org RESERVE YOUR SPOT TODAY! PRE-REGISTRATION REQUIRED!